One of the oldest applications for cold lasers was equine therapy. Using lasers on horses was a great early introduction to the technology because the results are so clear and visible. Animals cannot get any placebo effect from cold laser therapy so when an animal changes it's stride or behavior immediately after a Low Level Laser Therapy (LLLT) session, you know it is working. 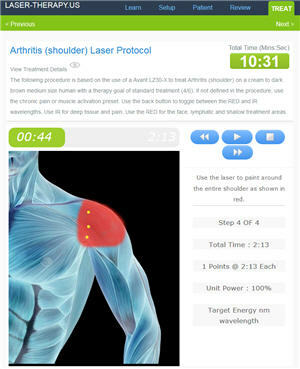 This application has very different requirements than cold lasers for home use and low level therapy (LLLT) devices for office use. One major difference is that there is no FDA clearance required for lasers used for equine therapy. This means the cost of cold lasers can be lower however it also means some products are sold on the market with no validation or quality standards behind the products. Cheaper systems often only put a fraction of the specified max power and many do not include any training or support making them both dangerous and ineffective. Some products like Eltech K-laser, Avant, and Thor are FDA cleared for use on humans but are also sold for equine applications. The Nexus and Aspen systems, for example, allow you to enter a pass code that automatically switches between human and animal protocols so there is never any confusion. Thor and Apollo products have different protocol manuals as well. Buyers must rely on the specifications and the reputation of the company, that are not FDA cleared, to build, test, and support their product to make sure they are delivering on their specifications. A non-FDA cleared device can save you money if you are willing to take the risk. The following outlines different factors to take into account when selecting the best cold laser for equine therapy. Wavelength: One of the biggest decisions to consider when buying an equine laser is which wavelengths are best. Since wavelength determines the depth of penetration, selecting the proper wavelength is critical. There is NOT one perfect wavelength for equine applications, but studies show that 800 to 860nm is the best option for most therapies. For some applications (like superficial damage, abrasions, hoofs and cuts) Red (600 -640nm) is the better wavelength. 905nm also provides good efficient energy transfer to the cells and deep penetration. In general, 980nm became popular because the diodes are cheap because they are used in surgical lasers because most of the energy is converted into heat to cut and cauterize (just search on 980nm surgical laser to see why they are such bad therapy lasers). You can read more about different wavelengths and how they have different interactions with the tissue here. Broad and Fine Area Therapy: Lasers with broad coverage heads allow for treating a large area directly and evenly. More advanced practitioners also use laser acupuncture to treat the meridians to treat the energy levels in the body, trigger points to treat the muscular system and the lymph system associated with the problem. In general, using a single non-divergent laser beam like you get in lower-end products is like trying to color in a full sheet of paper with a fine-tip ball point pen. The coverage is so random and uneven that it cannot deliver consistent results. For most applications, you want a larger treatment area so a more powerful system or a system with multiple diodes is recommended. Durability and Portability: Cold Lasers for Veterinary and Equine usage are often grouped together, however there is a big difference between these products. The biggest difference is that equine cold lasers need to be very rugged and sometimes portable. Electronics tend to take a much bigger beating in the barn than in a sterile veterinary office. Higher power class 4 laser system (10 watts and up) must be kept in a clean environment so they should not be stored in a barn. Small particles of dust can heat up from the laser energy and damage the laser. As long as the system is stored in a clean area, higher power system, are fine. Power: If you spend much time on ColdLasers.Org, you will see that we don't try to up-sell everyone on more power. With more power comes more risk. Even with a giant budget, it still may be best to get a lower power laser. That being said, things are a bit different in the equine market. Provided that you use the product properly, power is more important. Many horse injuries have large overall tissue damage that is both broad and deep. Having higher power means you can cover a large area faster and deeper. We never recommend more than less than 400mW or more than 15,000mW for equine applications. The following table includes lasers that we sell on ColdLasers.Org as well as other popular lasers. We are not dissing or recommending these other products. We feel it is important for you to know all your options before you buy a product. We have done our best to accurately show their specifications but some companies like to keep their specs a secret for some unknown reason. There are many other products that primarily target other markets and can be used for equine therapy, we have not included those products in our table. Options are listed in order of increasing power. We left out a lot of desktop options that might not stand up to the environmental requirements of an equine laser. This table is sorted by increasing power level. * Multi-wavlength does not include the guide light as it is designed to illuminate the treatment area and not treat it. One of the last critical areas to consider when buying a system is the level of training that comes with the laser. 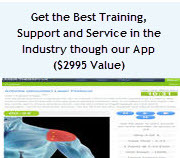 Many systems from other sellers do not include adequate training on how to use the laser horses. Every system that we sell includes the laser-therapy.us animal protocol library (You can see all the available protocols here). The laser-therapy system used the best practice of dynamically calculating the dosage based on key factors like the size of the horse and color of the horse. If you are using a printout of other statically created protocol, you need to get your calculator out or your dosage can be horribly wrong. Size, color and therapy objective have a huge impact on calculating the optimum dosage for the best results. This is especially key for anyone who does not have experience using a laser on an animal. 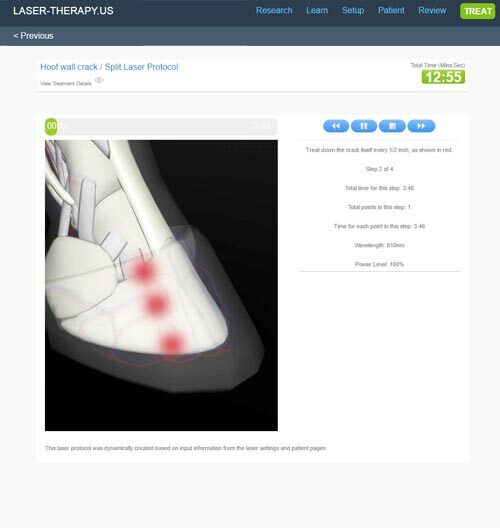 When you purchase any animal laser from ColdLasers.Org, we include the information that you need to properly treat animals using the current best practices. For most cases, we recommend buying a 800nm to 860nm wavelength rugged laser with a power of more than 400mW and less than 15,000mW. A great system will also have energy output in the RED spectrum. For treatment of superficial injures and hoofs, we recommend a cold laser that also operates in the 600nm - 680nm wavelength. The Avant systems are highly recommended because they operate in both RED and IR plus they can do both pulsing and continuous wave. 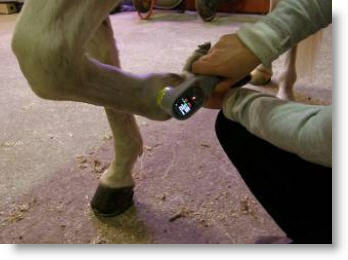 With the included light pipe, a skilled practitioner can also treat the horses meridians, acupoints and trigger points. That means, you have 4 different types of therapy you can use for treating a condition and that means even more amazing results. If you desire more power and have clean work area, look at the EVOlaser because they cost 20% - 30% less than similar specified class 4 systems. If you looking at lower-price systems, the RG500i and VL1500 are great performance for the price. They are very rugged and have adjustable power and adjustable pulsing at the ideal wavelength of 810nm.